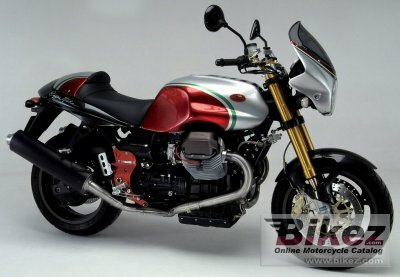 2004 Moto Guzzi V 11 Coppa Italia. Picture credits - Moto Guzzi. Submit more pictures. Comments: V11 Coppa Italia - The motorcycle produced to celebrate participation in the Italian Naked Bike Championship in �03. The design is classic, compact and muscular exposing the latest 90� V-Twin with added crossover pipe and increased compression ratio to 9.8:1. Brembo Gold Series brakes. Ohlins front and rear suspension and steering damper. The Sport Bike par excellence from the Mandello del Lario company. Available in limited numbers in Tri-color Silver, Red and Green. Ask questions Join the 04 Moto Guzzi V 11 Coppa Italia discussion group or the general Moto Guzzi discussion group. Get a list of related motorbikes before you buy this Moto Guzzi. Inspect technical data. Look at photos. Read the riders' comments at the bike's discussion group. And check out the bike's reliability, repair costs, etc. Show any 2004 Moto Guzzi V 11 Coppa Italia for sale on our Bikez.biz Motorcycle Classifieds. You can also sign up for e-mail notification when such bikes are advertised in the future. And advertise your old MC for sale. Our efficient ads are free. You are also welcome to read and submit motorcycle reviews.